Finishing bottom of the Football League Macclesfield were relegated from the League along with Hereford United, their places being taken by Blue Square Conference promoted clubs Fleetwood Town and York City 2011/12 Conference table and play-off results. 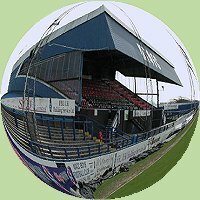 The Silkmen won their League place back at the end of the 2017/18 season when finishing as National League champions - Macclesfield and Tranmere replacing Barnet and Chesterfield in the Football League for the start of the 2018/19 season. There was a time when Bobby Charlton's daughter - Suzanne Charlton - was seen more often on television than her dad. What was she doing?